Does anyone know his name . my great grandfather Thomas/George Lawson was stationmaster in the early 19ooo's and possibly late 1890's . If you need a date, the posters refer to the death of Grieg (which occured on September 4, 1907) and a problem with the Anglo-American Polar expedition which happened a couple of days later. I was once a Trainee Hotel Manager with the North British Trust Hotels Group. 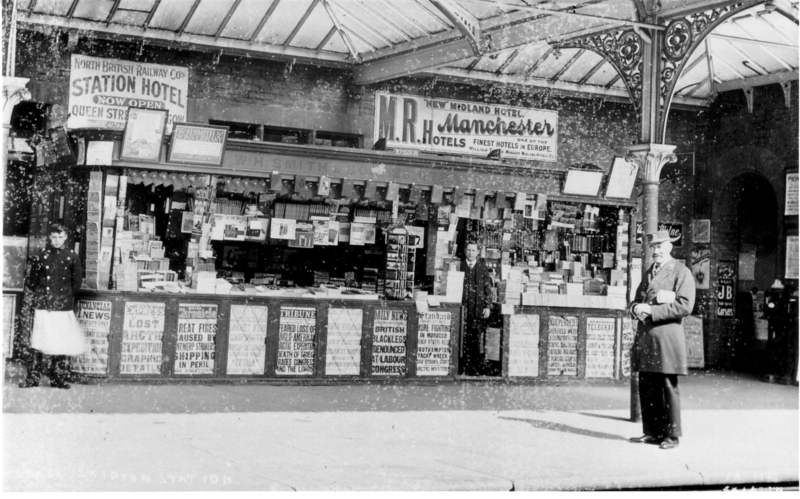 Possibly an offshoot of the North British Railway Coy whose Station Hotel, Glasgow, is prominently advertised on the left of the Newstand. Alfred Norman was the Station Master at Skipton from October 1877 to the end of October 1908, when he retired. It is recorded that he had 44 year's service with the Midland Railway. I believe he was aged 62. His salary was £235pa in 1905. I believe the gentleman standing at the station bookstall in the background to the right could be my relative, John Alfred Noke. I've only recently discovered that he was in charge of the Skipton railway station bookstall from 1899 to his retirement in 1938 and was employed by W H Smith & Son for nearly 53 years. He was also a passenger on the first train on the Yorkshire Dales Railway in 1902, between Skipton and Grassington. My Great Grandfather was station master after your great grandfather. His name was Frank Mellor and he was station master there 1910's and 1920's. he lived on Firth Street.